The poetry of Helen Steiner Rice is truly a gift of love. Wrapped in profound truth and beauty, her verses convey the essence of God's love in a simple, down-to-earth manner. You'll find your spirit lifted and your heart drawn to the heavenly Father as you read this wonderful collection of poems. - Publisher The poetry of Helen Steiner Rice is truly a love gift. Wrapped in profound truth and beauty, her verses convey the essence of God's love in a simple, down-to-earth manner. A Collection of Love Gifts will be treasured by Mrs. Rice's many devotees and embraced by those first-time readers who realize immediately a kinship with the poet, a bond wrought by tragedy and sustained by divine love. This beautifully-bound full-color gift volume of inspiring verse will lift hearts and spirits who receive it. Through poems like "Finding Faith in a Flower" and "Let Not Your Heart Be Troubled," Helen Steiner Rice encourages readers to experience the enduring love of their heavenly Father. 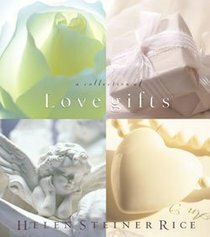 About "A Collection of Love Gifts"
The poetry of Helen Steiner Rice is truly a love gift. Wrapped in profound truth and beauty, her verses convey the essence of God's love in a simple, down-to-earth manner. A Collection of Love Gifts will be treasured by Mrs. Rice's many devotees and embraced by those first-time readers who realize immediately a kinship with the poet, a bond wrought by tragedy and sustained by divine love. This beautifully-bound full-color gift volume of inspiring verse will lift hearts and spirits who receive it. Through poems like "Finding Faith in a Flower" and "Let Not Your Heart Be Troubled," Helen Steiner Rice encourages readers to experience the enduring love of their heavenly Father. From the 1920s and beyond her death in 1981, Helen Steiner Rice was and is an unofficial poet laureate of hope and optimism. Her books have sold more than seven million copies and comforted nations through some of history's darkest moments. There probably isn't a family today that hasn't received or sent a greeting card featuring Rice's work, and her writings continue to inspire a new generation on-line, in gift books, and through note cards.- Publisher.